I’m constantly looking for ways to make eating Paleo more interesting. Dairy and grains usually make up a huge part of a regular diet, and a diet that is void of them runs the risk of being bland. So I was more than excited to find a recipe for pancakes at the Civilized Caveman (a blog dedicated to eating Paleo) that are completely grain-free (and gluten-free!). Of course, I’ve been grain-free for a long enough time to have surpassed my addictions to carbs. However, someone who is new to Paleo (or any other diet that restricts their carb/grain intake) will see this recipe as a Godsend. If you’re going to make syrup, I would start this first before making the pancakes so it can simmer while you cook. Civilized Caveman preferred raspberries in this syrup, but I didn’t have any on hand. But I did have a whole slew of strawberries which served as a delcious substitute. I imagine any fruit would work well, though make sure to adjust ratios accordingly (i.e. blueberries might require more water since they tend to gell up). 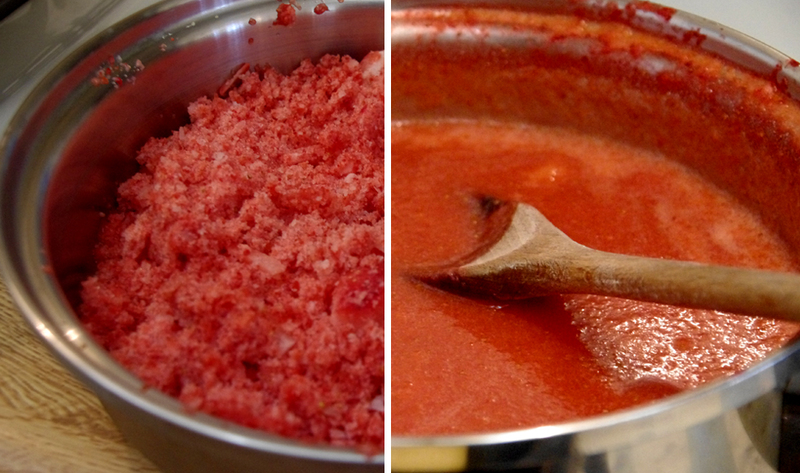 Grind the fruit in a food processor. I like a little bit of lumpy fruit in the sauce, so I allowed a few chunks of strawberries to remain in. Put the fruit in a pot, then add the water. Let it boil about 10 minutes, or till the fruit seems cooked through. Set aside, or let it simmer on low. 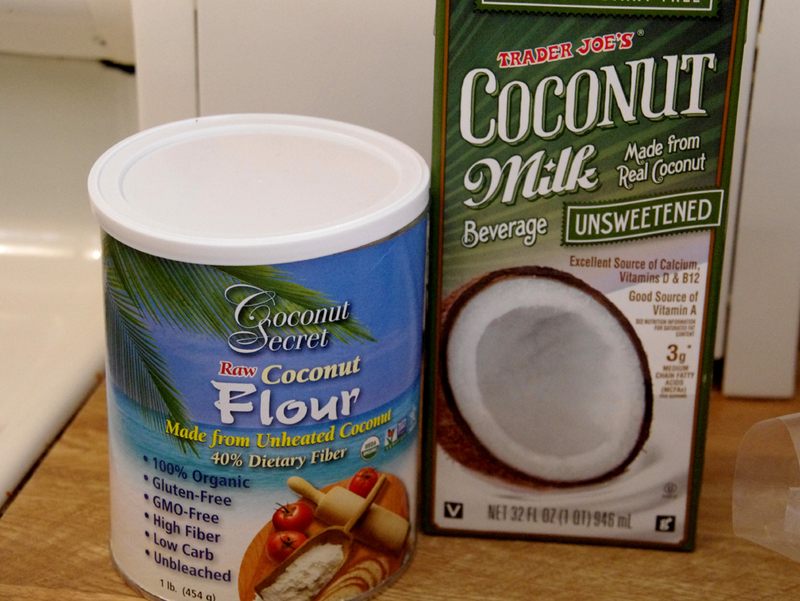 For the pancakes, I found the coconut flour the most interesting. I never knew such a thing existed! But sure enough, there it was in my local Whole Foods, my go-to whenever I need an off-the-wall ingredient. It’s located by the regular flours, near all the gluten-free alternatives. While there, I also picked up some coconut butter, thinking it was just another name for coconut oil. It’s not. But it is very similar to something like peanut butter (well, more like tahini), and tastes so delicious I could eat it by the spoonful. At any rate, add the first 5 pancake ingredients together until free of lumps. Heat a griddle or pan and melt the coconut oil in it. 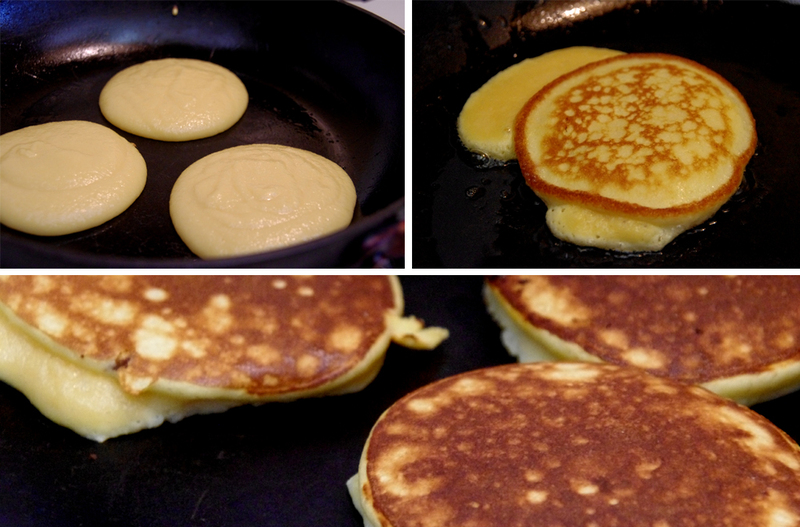 When good and hot, ladle the desired size pancake into the pan, letting it cook for 3-4 minutes. I’d like to think I’m a pro at flipping pancakes. Heck, it was the first food I ever cooked, and the food I taught my daughter to make when she was learning to cook. I know when to flip them, turn them, let them sit, and remove from heat. I can make them a golden brown color and ensure they’ll never land on top of each other. But these ones? First off, they don’t bubble up like regular pancakes. However, that wasn’t my main problem. My biggest problem was I had the griddle too hot, and then flipped them too soon. Then I kept them on too long. Then I didn’t keep them on long enough. Then liquid poured out each time I flipped it. It wasn’t till the last pancake when I sort of got it. However, they still produced a pretty good looking stack of pancakes. Once ready to serve, strain the liquid through a mesh strainer, putting the liquid back in the pot and reserving the chunks of fruit left behind. Add the honey and let it melt into the liquid. Pour over the pancakes and then add the fruit. Confession: Being totally guilty of A.D.D. when it comes to following directions, I didn’t realize that I was supposed to strain it until I was typing this out. I actually added all the ingredients together in the beginning, and then poured it on when I was done with the pancakes. Also, I added twice the amount of honey since it still tasted somewhat sour with only 1 Tbsp. The verdict? These were ok. Or they were great. Or they weren’t good at all. My tastebuds haven’t quite figured these out. If you eat them expecting them to taste like pancakes, you’ll be disappointed. My carb-loading fiance was not impressed with these at all. Luckily I knew that going in and had already prepared him a batch of Krustaez. My adventurous son thought they were ok, though he went for second when he was done. 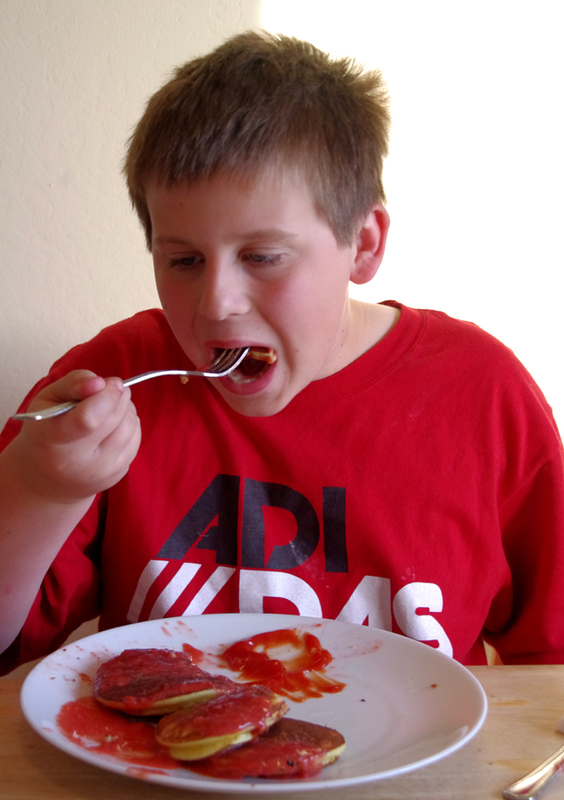 He was most impressed with the sauce. I found the pancakes to be a decent substitute with the consistency of bread, but not really a bread taste. However, the taste was intriguing. And filling! I ate three of them and was totally stuffed. If you try them, let me know what you think. If you want to know how to make them without a bunch of blog chatter, or just discover some pretty creative Paleo recipes, visit civilizedcavemancooking.com. We have made these several times and we all thought they were fabulous!! In fact I just pulled out the recipe to make them again tomorrow. We have been grain free for awhile now though…it is definitely an “acquired” taste. I haven’t made this sauce yet, we add blueberries to the cooking pancakes (before you flip them) and then use some 100% maple syrup on top. Yummy!! 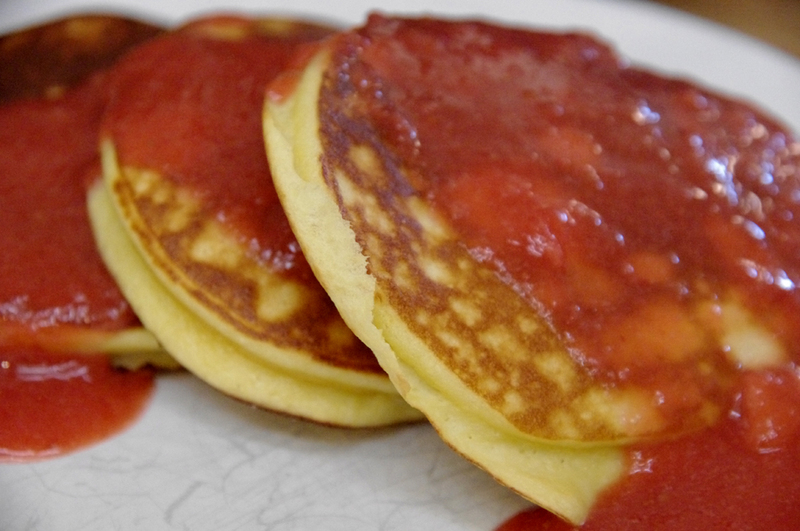 I have several other grain free pancake recipes if you are interested in trying some others. Let me know and I will send them to you. Yes! Send them to me, I’d love to try out some new recipes! oh…and check your coconut milk. The packaging above says coconut milk beverage. Real coconut milk is very thick. You have to be careful with which kind you buy. If you get the wrong one, you have watery coconut milk, which will cause the batter to be too runny. Also if you are using light coconut milk it will be runny. Full fat is best. Good to know about the coconut milk. I bet that would make a difference. I’ve been mostly grain free for months now. I go through the occasionally bouts of boredom with it, but then I find recipes like this that shakes things up. I’ll definitely try it with better coconut milk. And I like your idea of adding blueberries!